Late in the 20th Century Chief Engineer Montgomery Scott is at the PLEXICORP offices with Dr. McCoy and trying to explain how to construct “transparent aluminum” to Dr. Nichols, the plant manager. Dr. Nichols looks concerned and instructs Scotty to “just use the keyboard”. After stretching his fingers like a concert pianist Scotty begins typing furiously on the Mac’s keyboard, quickly producing a detailed 3-D graphic to describe how to manufacture transparent aluminum. As Scotty would tell you, using the keyboard is clearly better than using a mouse. I mentioned before that one of the myths that I clung to before considering a Mac was that it was a highly mouse centered machine. Indeed, Macs take better advantage of the mouse than most other operating systems do, especially in the drag and drop department. See an image in a web page that you want to grab? 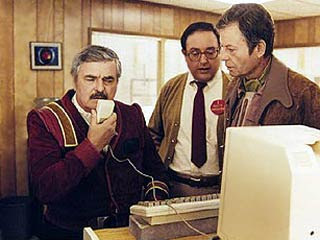 Perhaps an image of Scotty speaking into the mouse in Star Trek IV? Just drag it out of the browser and on to your desktop. Clearly the mouse works great on Mac for many tasks, but so does the keyboard. The usual navigational shortcuts are there for text handling and there are system standard shortcuts for things like preferences, window management, file saving, etc. But if you are a touch typist tools like Spotlight, Quicksilver or LaunchBar add an entirely new dimension to using the keyboard. In the time it takes to move your hand over to the mouse, position the mouse pointer on the screen and perform an action you can often do the same task more quickly by using the correct keyboard commands. I can select a couple of words by holding Shift-Option-Arrow and then bold it by pressing Command-B in Pages. The mouse alternative is to reach over to the device, position the cursor on the desired text, click and drag-select, then reposition the mouse to the toolbar and click the Bold button. I personally find myself in one of two distinct phases of computer usage most of the time. If I am in text creation mode, especially when creating large volumes of text or program code, the keyboard is my primary device. As much as possible I try to keep my fingers on the home keys and use the various shortcuts to get around. My net typing speed is 54 WPM on my MacBook Pro’s keyboard (you can test your own typing speed at TypingTest.com). While I will occasionally grab the mouse when I’m in this mode, more often than not I simply try to use the arrow keys or shortcuts to perform tasks. I have a hot key to activate Spaces and switch to a different area, use Command-Tab to switch between applications, move between browser tabs using Option-Command-Arrow, etc. This mode is also prime LaunchBar / Quicksilver time. A quick Command-Space and a couple of keys later and my application is front and center or the document I need loaded into Pages is right there. When I am browsing through web sites or scanning through my RSS feeds in NetNewsWire I tend to be in full mouse phase, rarely even touching the keyboard. If I’m using my external mouse the scroll wheel gets a lot of work whereas if I am using the track pad on the MBP I use the two finger scroll. Since I’ve set up my external mouse to use SteerMouse I also have mapped a couple of the extra keys on my Logitech Mx510 to open Spaces, move forward and back with the browser, open a link in a new browser tab, etc. So which mode works best? A commenter on this blog turned me on to a great article written nearly 19 years ago by Bruce Tognazzini, the founder of the Apple Human Interface Group and a renowned usability expert about using the keyboard vs. using the mouse. While Tog maintains in the article that people in tests are faster with the mouse than the keyboard, most people disagreed at that time with his findings. A lot of time has passed since the article was produced and if anything keyboards have become far more ergonomic and many standard shortcut combinations have had significant time to “bake” and become second nature. When all is said and done my preference is to use the keyboard as much as possible. I know that when I’m in the zone and popping between tasks rapidly using the keyboard I feel extremely productive. When creating many of my blog posts I reference application specific features and I find myself bouncing between different sites and local applications, capturing screen shots and pasting in URLs for hyperlinks. Add in a tool like LaunchBar and my productivity goes up even higher. I think James Doohan would agree.